One of my 3-year-old’s favorite toys is this ol’ hand-me-down Sit-and-Spin toy. She’ll sit on the top and spin. She’ll sit on the base and spin. She’ll stand and spin. She just goes round and round. I get dizzy just watching her. But I thought the colors blurring as it spun was pretty neat. So I stole borrowed the toy for awhile and photographed it whirling around. She wasn’t impressed with my photographic interest in it. She just wanted it back… to sit and spin the afternoon away. What toy did you love as a kid? That’s my favorite toy, too. I don’t think they make one big enough for me though. Ha! I like the photo! Cool effect. I don’t remember what it was called, but it attached to your foot, and had a string with a ball attached to it. You could kick out your foot and get it going and then jump over it with your other foot. I know it sounds complicated, the way I’ve explained it, but it was simple and for some reason, I loved this toy. I could ‘walk’ all the way up the block to visit my little friends, with this device attached to my ankle. I loved jump ropes, too. Oh, man! 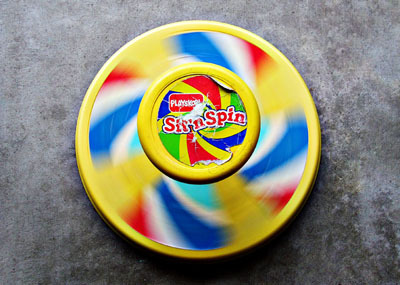 I always wanted a Sit ‘n Spin! My favorite thing to play with as a child was the Sunshine Family – they were Barbie-sized dolls with a mom, dad and kids. Too bad they don’t still make them…I think they’re a much better alternative than the Bratz dolls. I used to love my Hippity-Hop. It had Mickey Mouse ears and I would hang onto the ears and hop all over the place on the big ball body. Love the swirling colors photo!! Love that shot! I need to find one of them because I think our kids would love one.